A few months ago I was asked "If you could do anything you wanted, if you didn't have to work, what would you do?" I stumbled over my response. Not because the query came from my boss and I feared offending him. Not because I don't have the typical lottery fantasy of chucking it all in, packing a bag with naught but a toothbrush, a passport and a credit card. I was caught short by his phrase "...if you didn't have to work..."
My imagination stumbled at the notion of not working, of not showing up for life day after day, of not being responsible for something or depended upon by someone. But although I can't imagine life without a day job, my definition of work defines my dream. 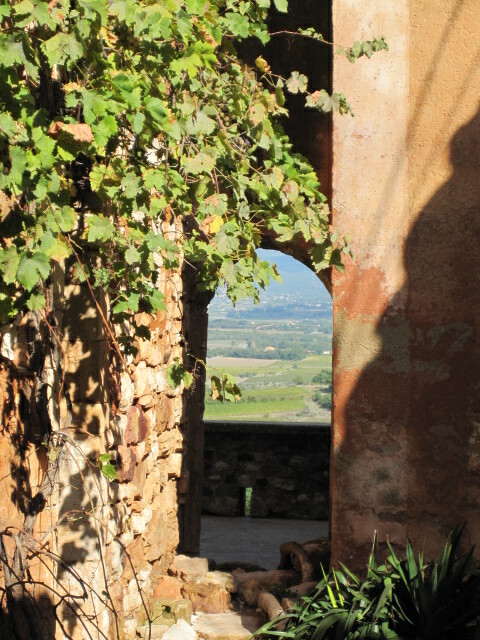 This photo taken in Roussillon last autumn is a window onto that dream. It is a dream I lived briefly with Brendan in New Zealand, engaged in the most physically challenging yet most mindful work I have known. It was a time of searching for peace and finding it in the dawn trek on quiet Canterbury highways that led to vineyards just awakening from their winter's rest. Weeks slipped softly into months, then into seasons, seeing us first bundled against the winter chill, then shadowed from the sun with wide-brimmed hats and long sleeves. The hours spent working side-by-side as a crew of two in the stillness of the vineyards, sometimes working to tearful exhaustion, brought tremendous satisfaction and quiet to my chattering mind and a magical sense of oneness to our marriage. Our trip to the Luberon last fall, wandering along another set of highways that led to other vineyards, brought us back to that peaceful and poignant time. We forgot the pain in the carpel tunnel of both my wrists so severe I couldn't hold up a coffee mug or book, or the constant ache in Brendan's shoulder and back from yanking cut vines from their stiff trellis wire; memories of toes frozen by frost despite three pairs of socks and thick boots, the wind blowing the heat and dust of Australia into our eyes and down our throats, or peeing in full view of hapless sheep and a passing train were stories to share with a laugh. We pined for the stillness of an empty vineyard, dawn tumbling over the Pacific Ocean in a rush to warm the budding vines. We pictured ourselves huddled against the rain in the boot of the Honda hatchback or sprawled on the soft grass, bare toes free from their leather prison, eating crumbling tuna fish sandwiches and slurping chicken soup from a thermos. We could feel again the bliss of shared fatigue and accomplishment as the day's light waned in the shadow of the Southern Alps. So, if I could do anything I wanted, I would work. I would work in that vineyard you see from this Roussillon window. I know how hard it is and still my heart soars at the thought of rising before dawn to plant, prune, wrap, train, pick, weed, mulch, count, crush, drop wire, replace posts, feed the chickens that eat the bugs and tend the lavender that will grow in fallow fields. The key to this dream is that it is shared by a man whose work ethic is more vast than the Gobi Desert and more unshakable than Mt. Everest. It is he who would send me on my way before the heat of the day sets in and my fatigue makes me prone to error and irritation. For truthfully, he wants to be left alone to putter in his vines or kvetch with the neighbors who have come to lend a hand and a tractor. For in this dream that unfolds in the Luberon, there is a small stone house of tile floors and timbered ceilings, and in this house there is a cool room with a terrace that faces north and blue-shuttered windows that overlook our vineyard and olive trees to the southwest. It is there that the hardest work I dream of doing awaits me. The work of writing. Newer PostTune in, turn on, say "Ahhh...."